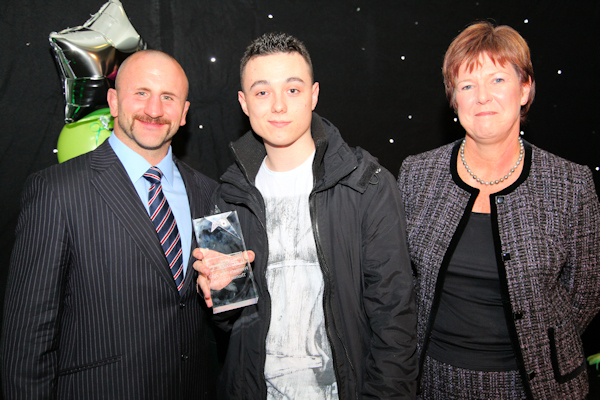 Thomas Howkins being presented with his award by Marion Plant OBE and George Chuter. 17-year old South Leicestershire College (SLC) student Thomas Howkins, from Enderby, is celebrating after winning two achievement awards at a recent awards ceremony despite previously being excluded from school when he was younger. Thomas was presented with the Principal’s Prize and IT Student of the Year awards by England Rugby International George Chuter, at the College’s recent STAR awards ceremony. Thomas first joined South Leicestershire College on the Inclusion to Excellence Programme, which is designed for 13-16 year old students that have been excluded from school. He successfully completed the course and went on to the Level 1 IT course, where he found that learning about something he really enjoyed and having lots of support from lecturers, motivated him to do well. His attendance was over 95% and he passed his course with flying colours. He has now progressed to level 2 IT and is looking to gain more qualifications before going on to university – something he says he would never have considered prior to attending the college. “I really didn’t enjoy school – my attendance wasn’t good and I didn’t put any effort in. Being at the college has completely changed me – it’s given me a focus, given me something to work towards. I have made friends and have a better social life. At the college tutors care about you, they understand your problems and help you. “Thomas used to hate going to school, and he really wasn’t heading in the right direction. “Thomas’ achievements prove that with the right encouragement and support, whatever their starting point, our students can achieve more than they ever thought possible. We’re absolutely delighted with Thomas’ achievements and very pleased that his aspirations have now increased to match his true potential. The SLC Student STAR awards took place last week at the Leicester Tigers’ Welford Road stadium, which saw 26 students and employers receiving awards for achieving above and beyond expectations throughout the year.